Weekdays 6 a.m. - 8:30 p.m. Saturdays 8 a.m. - 6 p.m. Sundays 8 a.m. - 5 p.m.
Berkshire South Regional Community Center provides recreational, social, educational, and cultural programs for all ages. Meeting rooms, youth center, arts & crafts, pools, auditorium, gym, fitness center, lounge, locker rooms & sauna, year round child care/summer camp. Special offer(s): 10% off rental space (meeting rooms etc.) 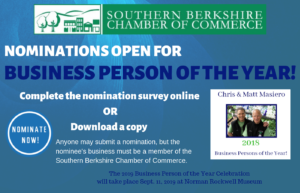 to members of The Southern Berkshire Chamber of Commerce. Located at the end of Crissey Road, off Route 7 (Stockbridge Road) in Great Barrington. Crissey Road is just north of The Price Chopper Shopping Center and just south of the Jenifer House Commons.